Advantages: A detailed look at the planning, strategy and tactics of the period, including the philosophical side of the campaigns. Excellent artwork and diagrams, with a varied selection of photographs. The German Blitzkrieg or “Lightning war” was an effective way of over running an enemy before they could assemble a coherent defense. The Luftwaffe played an important role in this strategy. Its job was to obtain air superiority over the chosen battlefield and create as much damage and confusion as possible. The ground forces would then attack with speed and surprise, to over come the disorientated foe. This is the second volume in the “Luftwaffe at War” series and it looks at the above stratagem from the perspective of the air force. The period covered is 1939 to 1940 which includes the campaigns of Norway, Denmark, the Netherlands, Belgium and France. It is not just the role of the dive-bomber, bomber or fighter that Edward Hooton examines in detail. A lot of attention is also paid to the challenges from the resulting long supply lines, communications and the inevitable conflicts in command. All this is contained in a large format book of 94 pages. Between the soft card covers, the reader will discover close to 150 black and white photographs. They have been picked for their relevancy to the text and offer a wide variety of subject matter. The captions are informative and compliment the passages very well. To help the enthusiast gain a better insight into these events, a selection of coloured maps and diagrams are included. In addition to this, there are sixteen profiles from Tom Tullis. Most readers will recognize these superb renderings as smaller versions of his work found in other publications. 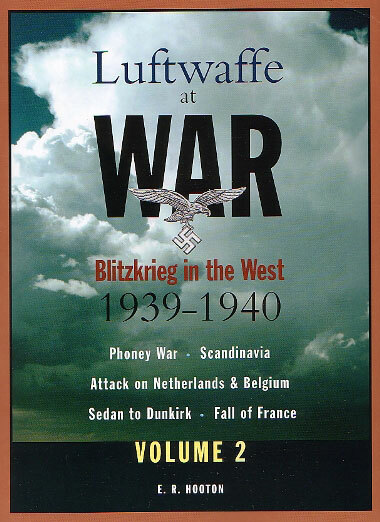 The chapters are divided up into sections on the Phoney War, Scandinavia, Luftflotte 2 Attacks, Sedan to Dunkirk and Fall Rot. The content is entertaining and easy to follow though on occasions it does help to re-read the odd sentence to grasp the complete meaning. A comprehensive bibliography rounds out the book and this contains data for both volume 1 and volume 2. The former entry is necessary due to an unfortunate omission in the previous publication. This book provides a detailed study of the planning and principles behind each of the Luftwaffe’s campaigns. Not only does it offer an overall view of these proceedings but it also gives the reader a better appreciation of the events from a philosophical perspective. All this leads to a greater understanding of the successes and failures endured by the once mighty Luftwaffe.